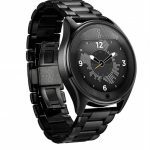 The Olio Model One is billed as a �luxury� smartwatch, it�s made of 316L stainless steel, and comes with either a 24-karat gold or 18-karat rose gold finish. You can choose an all stainless model, or one with a genuine leather band. It has Bluetooth to connect with iPhone or Android phones as a companion. The watch is �high-capacity� and will last for at least a full day, it also charges fast. The entire thing is water resistant up to 50 meters (or 164 feet). But all of that wouldn�t make a difference if the watch wasn�t truly �smart�. It has a personal assistant built-in for voice commands. It also receives texts, missed calls, emails, news, social alerts and more.